'MLM' The American Dream Made Nightmare: Muhammad Yunus - too naive, and now too implicated, to recognize 'Multi-Level Marketing' as a financial fairy story. 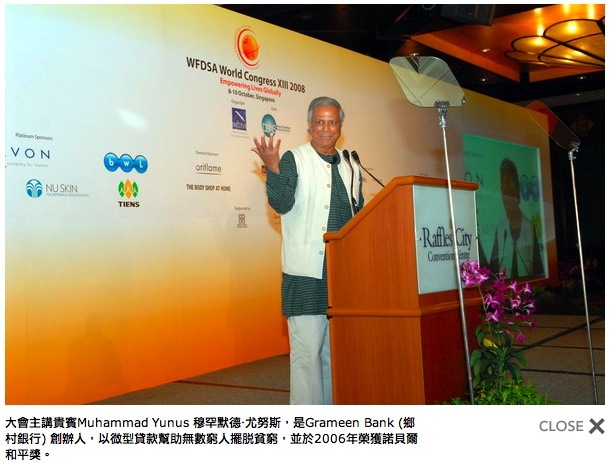 Muhammad Yunus - too naive, and now too implicated, to recognize 'Multi-Level Marketing' as a financial fairy story. Exactly how much cash has been lent to poor borrowers which they have then given to 'Herbalife' in return for effectively-unsaleable wampum? Are you saying Grameen is in on the fraud? If you you read my text again, you will see that the ill-informed and naive staff of both Grameen America and Grameen Foundation, along with the inventor of Micro-Finance, have all been duped by racketeers and used to facilitate the 'Herbalife,' and other 'MLM income opportunity,' frauds. Furthermore, when officers of these Grameen organizations have been confronted with reality, instead of speaking out, they have buried their heads in the sand. However, this child-like reaction is classic. Statistically, very few fraud victims ever come forward to complain. Indeed, many frauds are based on offering victims non-existent ways to make money that would be dishonest even if they existed. Thus, fraud victims often remain silent, because, in order for them to speak out, they would have to admit not only to their own stupidity, but also to their own dishonesty. There is an old saying that you can't cheat an honest man, but I don't hold with that in respect of 'MLM' cults. The majority of 'MLM' victims are not so much dishonest: as desperate. However, the senior officers of Grameen America and Grameen Foundation have no such excuse. LAPO is a large donor-darling MFI that lends to poor Nigerian women at rates reaching as high as 144% APR according to Chuck Waterfield at www.MFTransparency.org, and was described simply as illegal in publicly available rating reports by Planet Rating and MicroRate, amongst many other criticisms (savings fraud, sloppy back office, poor governance, chronic client desertion etc). However, it is extremely profitable and attracted money from all the usual suspects. Eventually the NYT ran a piece on them, at which point many investor panicked and withdrew. It was the biggest partner of Kiva at the time, before even they pulled out. GFUSA was one of the first in, and denies all claims. Not only did they invest their own funds, but they guaranteed the Citi and Standard Chartered loans to LAPO. Who knows how much information they disclosed to these two in the "due diligence"? Meanwhile, as you know, Yunus was preaching about the evils of extortionate interest rates (a lesson I applaud), and yet somehow GFUSA didn't seem to mind rates of 144%, even though Yunus sits on the board of GFUSA. As the debate over LAPO's extortionate interest rates was gathering publicity it was none other than Camilla Nestor at GFUSA who proudly announced that LAPO's rates would be verified by Chck Waterfield to resolve the rumours once and for all. They never published the results, suspiciously, and it was not until Planet Rating published them that we found out a possible explanation as to why GFUSA had kept sheepishly quiet about this: 144%. Following this scandal, another mysterious event happened. The Schwaab Foundation gave LAPO an award for Best Entrepreneur or some such nonsense. It transpired that Schwaab had never visited LAPO, nor did any meaningful due diligence, raising the question of how, given all the MFIs on the planet, did they give the award to LAPO, who had only recently been named and shamed in the NYT? Have a look at who sits on the Schwaab Foundation board. Then we have the opaque relationship between GFUSA and the Friends of Grameen (a lobby group to gather support for Yunus and Grameen Bank). They embarked on an unsuccessful smear campaign, with the assistance of Burson Marstellar, against the Tom Heinemann documentary. They refuted Heinemann's claims that Grameen Bank charged interest rates of up to 200%, when in fact Heinemann made no such claim. They even published the transcript of the "evil documentary" on their own website, where it is entirely clear that Heinemann never said anything of the sort. Regarding Heinemann's claims of the suspicious transactions that took place with Norwegian sector public funding, Friends of Grameen deny these entirely. Heinemann was kind enough to provide links to all the original documents from NORAD, and the evidence strongly suggests that Heinemann's account of events was closer to the truth than that of Friends of Grameen, according to the original NORAD documents. So, what you have stumbled on here is no surprise. This is an extremely murky institution, and features prominantly in my book "Confessions of a Microfinance Heretic - How Microlending Losts its Way and Betrayed the Poor". All my source documents are on the website www.microfinancetransparency.com if you would like to verify anything stated here. But do not fall into the trap of thinking that having evidence about wrong-doing will actually prompt any change in the microfinance sector. It is largely (not entirely) run as a religious cult. Criticism is stifled. Spin is the only remaining tool to defend an otherwise (largely, not completely) silly idea, and GFUSA are the world-leaders in MF-spin. Keep up the good work. Hugh Sinclair - Thank-you for your well-informed input and I'm very interested to correspond with you further. Please be careful, because many people draw the term, 'cult,' like a sword, but, when challenged, they can't give an accurate explanation of what they mean. Unfortunately, saying that a group is largely (not entirely) run as a cult ('religious' or otherwise), is usually tantamount to saying that a counterfeit banknote can't be entirely valueless, because only parts of it are imperfect. That said, I think that it was very predictable that the micro-finance sector would become perverted by cultic charlatans; for the peddling of a cruel illusion of future financial redemption, is how the bosses of 'income opportunity' cults have ensnared their poor victims.